A Manager's Guide to Building a Relationship with the Team - esther derby associates, inc.
Good managers know how to build strong relationships in a traditional manager-led environment. But when a company relies on self-organizing teams to accomplish work, the relationship between an employee and his direct manager may not be his primary affiliation When organizations form real teams, the strongest bonds may be to the team, not the manager.Managers still need to maintain rapport with individuals, but now they also need to maintain a relationship with the team as a whole. What does that look like? Strong manager-team bonds come from co-creating, clarity, and coherence. And the team needs things from you, too. But what the team needs might be different from what a collection of individuals needed. Gather the team and find out. Start with two sheets of flip chart paper one of the team, one for you. Draw a line down the middle creating two columns. Label one Need, and the other Offer. Ask the team to work together to fill out their sheet while you fill out yours. Then compare what you wrote and what the team wrote. Then, work through the areas where you and the team seem to be close on what you need from them. This is a negotiation so be prepared to look for the needs behind requests and offer options. Once you’ve worked through areas of agreement, look at the requests that seem far apart. Some of them may be answered by the discussions you’ve had so far. For those that still need discussion, prioritize, and then ask “If you had that, what would it do for you?” You may learn something interesting about the team’s work environment and how they view your role. As with any relationship, you don’t have to say Yes to every request. Nor does the team have to do everything your way. Before you go into the session, be clear in your own mind about the critical things you need from the team to do your job. But be flexible on how to achieve them. The previous discussion may have already covered some decisions. You may want to document those in this step. 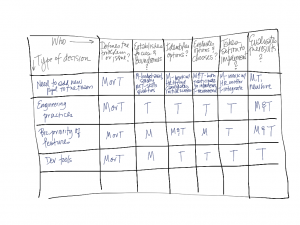 Then identify all the decisions that affect the team over the course of a typical quarter. Group stickies that seem similar, so you can see classes of decisions. Some examples of categories shared by many groups are hiring, training, tools, and technical decisions. Who evaluates the decision, once the chose option is in place? 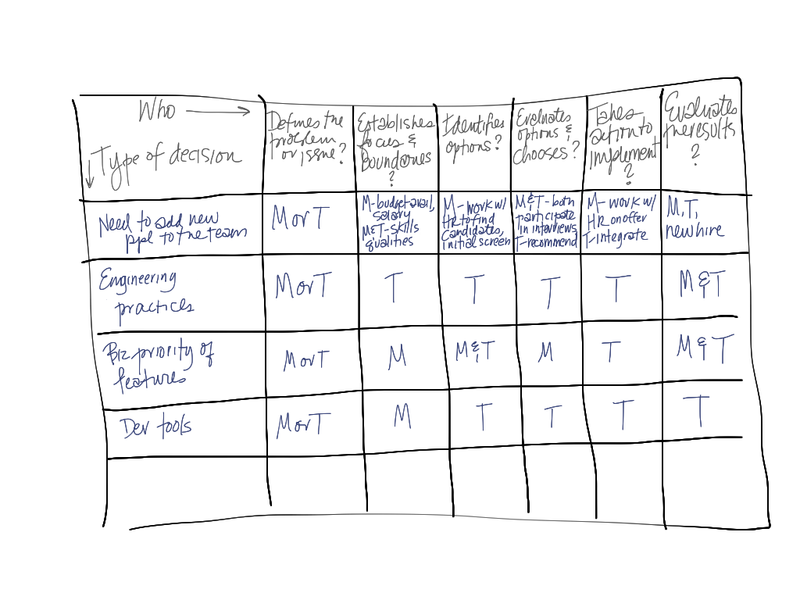 If you don’t find a pattern in one of the decision classes, the category may be too broad. Try breaking the category down. Don’t try to identify every single decision that team will make. Work to identify areas where the team has autonomy and authority. Delineate where you and the team will work together on a decision, and where the decision rests solely within your role as a manager. Clarity enables the team to act–without fear of crossing an invisible tripwire. It also reduces the likelihood of being blindsided by a decision, for you and team members. In some organizations, it feels like there’s one set of rules for managers and another for non-managers. This condition fractures relationships and erodes trust. Simple Rules (1) are a tool to bring bring coherence, and reduce the feeling that there’s one set of rule for “us” and one from “them.” Unlike working agreements, which usually address protocols for how to work together in a specific context, Simple Rules guide behavior in many situations across departments and levels in an organization. Simple Rules reflect values and aspirations about behavior. Start with a warm up, identifying common current patterns of behavior in the organization. Based on observed behavior, test what unspoken Simple Rules might drive that behavior. Ask the groups what patterns are effective, and which they might want to modify or add. Generate rules that would help that pattern emerge. Here are some Simple Rules from other organizations. Even if these seem like good rules, don’t copy–create your own! As you develop Simple Rules, consider the patterns of behavior that you want to foster. Simple Rules should be “minimum specifications,” rather than detailed prescriptions for behavior. Keep the list short–five to seven rules. More that that is too many to remember, and acts against the ability to apply judgment, take responsibility, and self-organize. In spite of the cries of a few pundits (and a few self-organizing teams), teams still need managers. But if you want the advantages of the self-organizing team effect, you have to make space for great things to happen. Sketch out the relationships boundaries, and Simple Rules to set the stage for creative approaches, solutions, and responsibility. (1) Simple Rules come from the work of Glenda Eoyang, hsdinsitute.org. What happens if a team breaks the agreed upon rules? Then you have a conversation. You discuss the situation that led to the action. You talk about whether the rule fits and is appropriate. You use it as an opportunity for learning. I currently have issues with team with some Change Resistance, some lack of comminment and tend to miss so much RUP/PMBok, I try to explain and give chance to put in practice SCRUM but I dont have good results, some good advise you can borrow?